A collection of the Old Hand's short stories, all of which appeared in The New Yorker magazine. 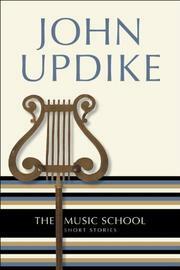 Again the Updike man is miserably in a bind where divorce has replaced dying as a kind of redemption. Suffering in trivial stasis, he occasionally breaks through (or is, more commonly, broken through to) toward a new equilibrium. But darkness made visible is still the dark, paradise is only the other side of the mirror, and the law of compensation offers just that--hardly release. In several stories a man rejects love, unwilling to dissipate himself, but he finds instead a new posture of loss in being rejected. In The Stare, the absence of love becomes a presence: in The Morning a man faces isolation after clothing his woman in a private vision and she leaves; in Twin Beds in Rome a wife regains her self-sufficient identity but the couple lose their union of conflict. The subject of separation is explored contrapuntally in At a Bar in Charlotte Amalic where a crazy assortment of humanity is united through a series of happenings. The Christian Roommates pits a square against an encircled pacifist. A shred of humor, a portrait, an exercise (Four Sides to One Story) but in the main these stories are sombrely concerned with the categorical fragmentation of human lives. A high standard for the genre as well as modern fiction.